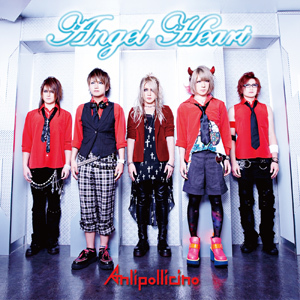 After a long wait since the release of the first album « TRANCEFORMER » in August 2012, Anli Pollicino finally came back in early January with their single « Angel Heart ». The band released two of the songs on online download sites for a very low price some days before the release, giving the opportunity to the fans to listen to them before having the CDs. The single was available on four different editions, including a limited version for only 500yens! Good thing for people with low budget and who wants to support a band. “Angel Heart”, composed by second guitarist Yo-1, was long awaited since the fans could have heard it already in concert, and particularly in the first live DVD of the band, named “69 Shake, at Shibuya Chelsea Hotel”. Starting with a catchy piano line, the first notes already give you the need to dance around. This song has actually a little fan dance associated to it, that you can see danced by the little boys in the music video. The studio version of the song has some auto tune on Shindy’s voice during the verses, giving to it a mysterious atmosphere, almost stellar. The song really can stay in your mind, and will definitely make you feel relaxed and smile. “Limit”, composed by bassist Masatoshi, really shows the new trance influence of the band since “TRANCEFORMER”. Allied with the electro sounds, the guitar line gives an unstoppable atmosphere and offers a frenetic solo. The soft voice of Shindy melts with this unchained rhythm, giving to the song a really different feel from the first track. “Lips to Lips”, composed by Yo-1 again, continues with the fast rhythm and uses saturated version of Shindy’s voice for the verses. The heavy sounds already from the beginning give the ton. It calms down for some seconds with the bridge but continues again with the chorus with a fast piano line and the bass solo comes just after, followed by a guitar solo as well. With three songs filled with entertaining melodies and the beautiful voice of Shindy, you will surely fall in love with the band if don’t know them yet.